Home / SkinCare / CHAMUEL MEN ANTI-AGING SKIN CARE RANGE. 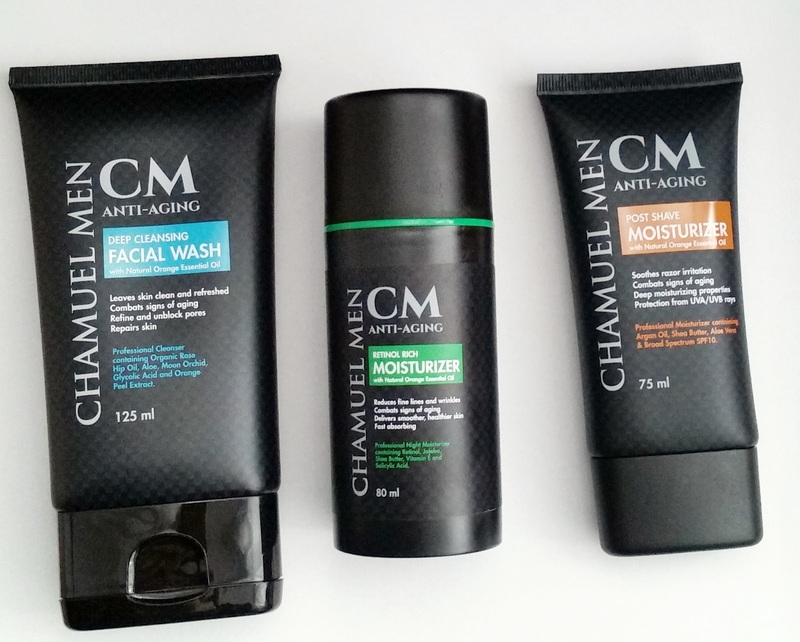 CHAMUEL MEN ANTI-AGING SKIN CARE RANGE. 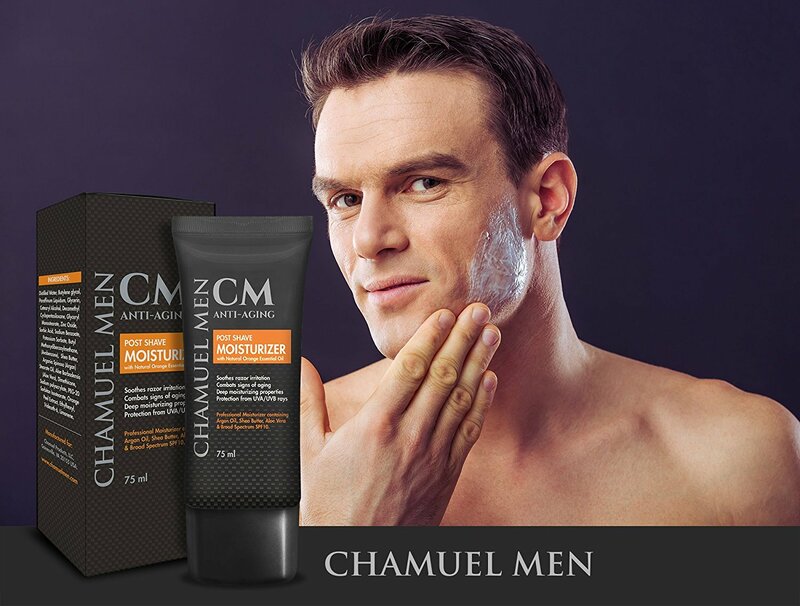 Chamuel Men offer a three step anti-aging skin care range that is suitable for all skin types. Specifically blended with high powered natural ingredients, thanks to their skincare knowledge, the range is paraben free. cruelty free and vegan friendly. 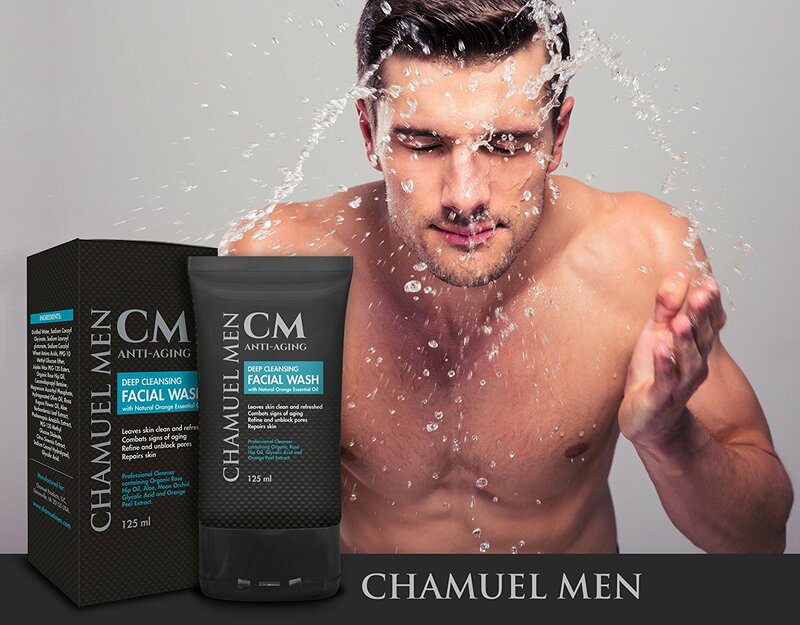 The Chamuel Men anti-aging skin care range consists of the men's deep cleansing face wash, men's post-shave SPF moisturiser, and the retinol rich night moisturiser. The products have be designed with intention to target and improve complexions of the age range of men from 30 to 45 years of age. Rose Hip Oil that locks in moisture whilst also delivering nutrients and vitamins. Aloe Leaf Extract, a natural moisturiser that soothes skin whilst killing any acne causing bacteria. Moon Orchid Extract penetrates skin to restore moisture, smooth fine lines and wrinkles, and blocks daily free radicals. Vitamin C, Magnesium Ascorbyl Phosphate is a water-soluble derivative of vitamin C that gently exfoliates without any irritation that some vitamin C's can cause. The essential oil Citrus Sinensis Extract detoxifies and nourishes skin whilst promoting cell-turnover to reveal a bright and even skin tone. Applying to a wet face, the luxury face wash lathers when using massaging movements over the skin. Washing off, your face will feel cleansed without feeling stripped of its moisture, revealing smooth and soft skin. A luxury face wash that can be used daily (morning & night) is suitable for all skin types. Pure Argan oil is high in vitamin E and is most common in skincare to hydrate and soften skin, making it a great natural moisturiser. Shea Butter locks moisture into skin whilst also helping to heal and prevent irritation. It is also a natural SPF10 sun protection. Aloe Extract helps to kill acne causing bacteria, something u may experience after a shave if skin is not thoroughly cleansed and clean. Orange Peel Extract that has antibacterial properties whilst also delivering an energising scent. The moisturiser glides over skin with ease and is light weight in texture, allowing it to absorb quickly. Smooth, soft skin is felt without any greasiness and does not feel heavy on the skin. You can apply to a shaved head, face and neck to protect skin but must be reapplied every 2 hours during constant sun exposure. The moisturiser is suitable for all skin types and is great for guys looking for a nutrient-rich moisturiser without clogging pores. The Chamuel Men retinol rich moisturiser, step 3, is your night time skincare moisturiser. The safe and gentle formula contains 2.5% retinol contained in an airless container to preserve its integrity. Natural Amino acids enhance collagen production, speeding up cell regeneration. Pure Jojoba Oil & Raw Shea Butter deliver hydration and moisture to skin, softening and soothing any irritation your skin maybe suffering from. Vitamin C is a powerful beneficial skin antioxidant to brighten the skins complexion, whilst the orange oil provides a light natural fragrance that also can fight acne. Retinol is proven to boost collagen production which in turn reduces wrinkles and fine lines. Speeding up skin turnover helps to brighten skin and even out discolouration, whilst also unclogging pores to reduce acne. First time users of retinol are guided to only apply the retinol every other night until your skin is ready to use nightly. You only need a little of the moisturiser, using more will not help to speed up results, and it absorbs really quickly on application. Skin is left smooth and hydrated overnight and the next morning has a healthy glow with a more even skin tone and texture. Always remember to use an SPF the next day when using any retinol product overnight as skin is more susceptible to the sun causing skin damage, which in turn ages your skin further. 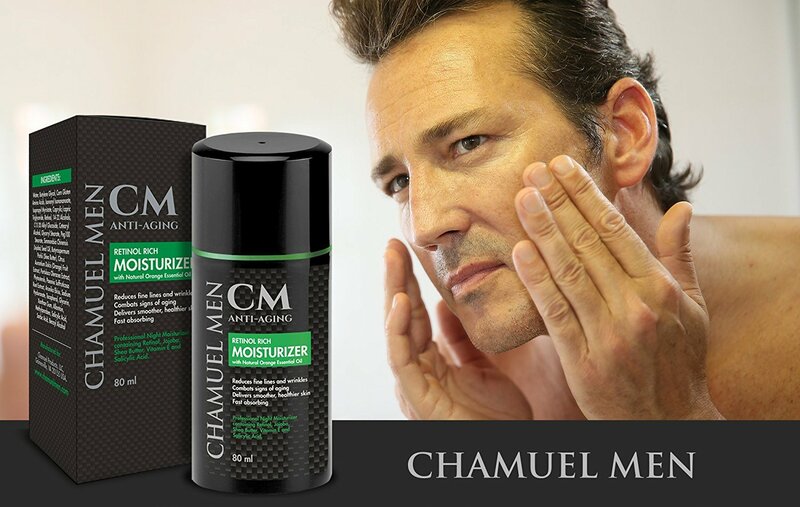 The Chamuel Men anti-aging skin care range is an easy-to-use regime for any man to follow. All the products work extremely well in reviving and renewing complexions, whilst not alienating any skin type. Suitable for sensitive, dry, normal, combination or oily, gives this range an appeal for any man looking for anti-aging benefits for their skin, without the confusion of how to use them. The range can be found on Amazon, Amazon UK & the Chamuel Men website. Use the discount code BLMALE25 for 25% off the entire Men's skincare line, whether buying one product or all three. Discount is valid from 23 November - 31 December 2017. X Neil.